I found this book to be a really quick, easy read. It came across more as a fable than a novella, really. I still liked reading it, but when I was picturing Monkey, for instance, all I was seeing was a generic monkey… which may or may not have been accurate. 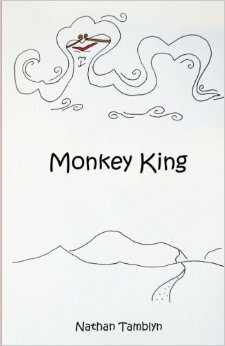 It was definitely interesting to see Monkey’s evolution as a character through this book, although I felt that some of his changes weren’t detailed as well as they could have been. It was good to see him as a cheeky, disobedient being who did learn to be humble and wise… although I’m not sure all of the lessons learned came across well. In particular, the group take fruit… and that didn’t really come across as a good deed or a bad one. I did like the elements of fantasy in this book and it would have been good to see a bit more of that. Some of what Monkey did made me smile, in particular when he went to save his friends/brothers from the two Fiends who wanted to eat them. And I especially liked it when Monkey had left, but was brought back due to being told that he was being insulted. I was a bit unclear about why the monk was there in the first place, even though I felt that the friendship between the group did come through fairly well. This book felt almost like a tale with a moral to it… but I wasn’t sure what the moral was. There were some parts of the book that made me smile and others that were a little more sad. The ending was a more hopeful one and the journey to get there was an intriguing one. I liked the extra short stories at the end of the book. The one about the two monks and the river was one that particularly struck me, as well as the one with the broken cup. The panda story was really well-written, too. I don’t know if I’d read more books by this author in the future, even though I did quite enjoy reading this book. It read more in the style of myth, without massive detail of the world and the characters.